In order to provide the best quality and professional care, we use only the most up to date technology. As a leader in laser dentistry and laser applications, reconstructive implants, and cosmetic oral surgery, we believe the best way to achieve the highest level of care is to combine technology, education and expertise. To assist in our procedures, we have three laser systems that are FDA approved for soft tissue treatment. The laser systems, CO2, Diode and ND/YAG, are very predictable, accurate and comfortable. In addition, we recently purchased a 3M Tru-Def digital impression scanner, which allows us to precisely duplicate tooth structure for computer-generated porcelain crowns. 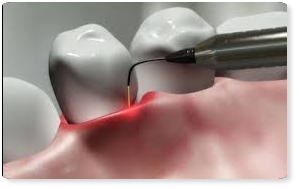 Dr. Paris was one of the first periodontists to utilize a laser for soft tissue applications in the U.S. His research in 1988 was in the use of a Dye-laser to inactivate porphyrin containing Bacteroides spp. causing advanced periodontal infections. It was the first research endeavor in the world that linked the effectiveness of lasers in treating periodontal diseases. He was the periodontist on the Board of Directors for the National Academy of Laser Dentistry. He served as an Examiner to certify dentists to use laser technology, and currently teaches dentists and staff, laser safety, and principles in dental treatment.